Celebrated American painter Cy Twombly, whose paintings featured scribbles, graffiti and unusual materials and who invigorated American post-War art alongside Jasper Johns and Robert Rauschenberg, has died. He was 83. Premiering nationwide Thursday on PBS is art:21's latest film, "William Kentridge: Anything Is Possible." Kentridge, a South African artist, is well known for his wide dynamic range of works: charcoal drawings, animations, video installations, sculptures and performance pieces. On Thursday's NewsHour, we profiled courtroom sketch artist William Hennessy, whose work has offered people a glimpse where cameras are oftentimes banned. Here is a slideshow of some of his most memorable sketches from the past 27 years. It's a beautiful, hot day in early summer in the Houston suburb where the artist Robyn O'Neil lives and works; only a couple of flinty clouds are in the sky over Texas. 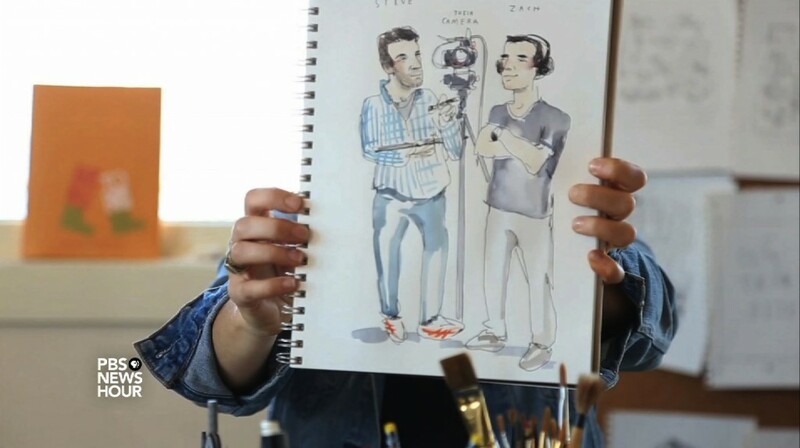 Two young men hit the road with sketchbooks from more than 2,700 artists. It's not the greatest heist of found art ever; it's the third annual Sketchbook Project, now touring galleries across the country in a two-door Honda Civic.